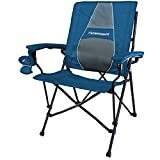 The best camping chair and backpacking chairs are listed together for the type you prefer for your trip to the mountains, the woods, at the beach, your favorite fishing hole, or on your patio in your backyard. The backpacking chairs are lightweight usually under three pounds. They are perfect for taking with you in the back country, for a picnic at the park, or a daytrip hike in the hills. Take the chairs with you when you set up your camping tent. Some style chairs need some type of balance to get into and sit in an upright position. 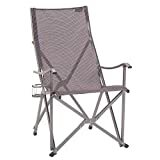 Buy a best camping chair that meets your requirements. If you’re on an uneven surface or on sand at the shore, stability is required unless you shove the chair’s legs into the surface to remain balanced. Most all camp and backpacking chairs set up in a few minutes. No one wants to hassle with a chair that takes forever to set up. The chairs reviewed here will having you sitting down in it in a few seconds. Big Agnes® is located in Steamboat Springs, Colorado, USA, and the logo camping chair is its limited Big Agnes 15th Anniversary Edition. 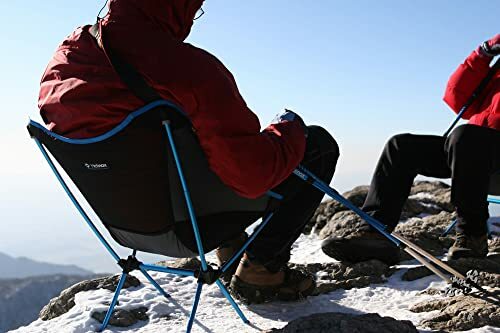 These chairs are award winning premium grade camp chairs using Dongah Aluminum Company® (DAC®) anodized TH72M aluminum alloy poles for the supports, the same aluminum pole technology used by DAC® in their Helinox trekking poles and tent poles. 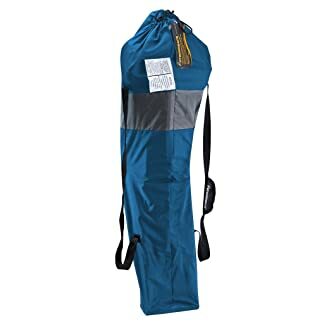 The fabric is 600 denier polyester for strength to support a 320-pound person with breathable mesh on the back and sides. You can select many colors for your setting, including camo for hiding out in the trees. DAC® has chosen Big Agnes® as the exclusive distributor of the Helinox brand in the Americas because of their commitment to innovative design and sustainability. Big Agnes® and Helinox® together manufacture and distribute gear using the latest materials and manufacturing processes, giving you lightweight outdoor furniture for all uses from the weekend family getaway to peak bagging across the globe. It is easy and fast to set up this folding camp chair. It will latch in place with the self-locking shock cord. Just take it out of the carrying case, included, then sit in it with fishing pole in hand sitting comfortably. Take it skiing and see the views from high up. It also has a cup holder for your cold or hot drink. Your neighbors will be envious when they see you lounging at your cookout in this chic chair. The dimensions are 20.5-inches wide x 19.7-inches deep x 25.6-inches high when fully set up. When closed for packing it is 14-inches x 4-inches x 5-inches and weighs a slight 1.9 pounds. The seat measurement is 13.5-inches from the ground and 13.5-inches deep. The packed weight in the included carrying case with zipper closure, grab handles, and daisy chain included, is 2.1-pounds. The case dimensions are 13.8 x 3.9 x 4.7-inches. You will receive the chair, carrying case, a User’s Manual and a 3-year Warranty from manufacturing defects with 7-days to return if you are not satisfied. The chair is made in Vietnam and the poles are made by DAC®, a South Korean company. The Coleman® sling chair is Coleman’s® item number 2000020294 that is the perfect patio chair for you and your guests for elegance and comfort. The sling style fits to your body contours when relaxing or reading. With the mesh seat and back, the chair will breathe and you won’t become hot and sweaty. Another smart feature are the solid arms to rest yours on and the GlassP™ drink holder to sit your glass, can, bottle, or coffee cup in. The aluminum frame resists weather with the fabric and framework. 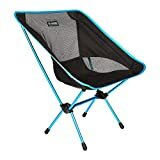 This is a super fold-up chair to take with you camping. It is ergonomically engineered and designed to be angled and high, especially for the support of your back and the seat is fully supported to not slip or slide for up to 225-pound folks. The front frame has reinforced bracing to not tip over and the color is gray with black trim. The dimensions unfolded are 28 x 22.5 x 37 inches. The folded dimensions are 5.1 x 5.5 x 44.3-inches and the carrying weight is 7.5-pounds. The seat is 23.3-inches with a sitting height of 16.7-inches. You will receive the chair, carrying bag, a User’s Manual, and a 1-year Limited Warranty. The GCI Outdoor® PICO (say pee-koe) Arm Chair™ is comfortable, sturdy, and available in midnight, navy, and sage colors with white and black trim. 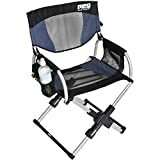 The patented PICO Telescoping System™ folds down to 1/16-inch of its open size and is one of the a best camping chairs on Amazon.com®. The chair has 2 mesh storage pockets on each side with a mesh holder for soda cans or bottles. The chair is made of light and durable anodized aluminum with a powder-coated steel frame. 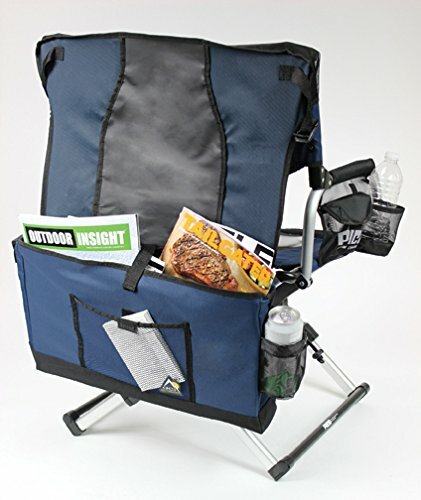 You can keep the chair folded in the included carrying bag that has a padded shoulder strap and doubles as the Chair Back Storage Caddy™, with space for magazines, books, beverages, sunglasses, cell phone, tablet, and more. Take your chair hunting, camping, boating, to sports events and put on the patio. Great for the kids to take to college and for apartment dwellers. The fabric is 600 denier nylon and polyester mesh and breathes to keep you cool and never sticky and sweaty. The chair’s feet are nylon coated to not scratch surfaces. The chair will hold a 250-pound person comfortably. The dimensions when opened are 20.9 x 21.7 x 33.9-inches and the folded size is 19.7 x 3.9 x 12.4-inches. The seat height is 16.9-inches and the weight is about 9.7 pounds. Bikers can attach the case with chair inside easily to their ride. You will receive the chair, carrying bag with strap, a User’s Manual, and a 1-year Limited Lifetime Warranty. The STRONGBACK® Elite™ blue and gray camp chair with side arms is portable, lightweight, and strong. The frame incorporates a comfortable lumbar lower back support for comfort to your lower back. This chair is unlike others in the marketplace with its ergonomic design, your back will be free from pressure, and it’s easy to get out of the chair. Your legs will never be pinched from the fabric on the front. 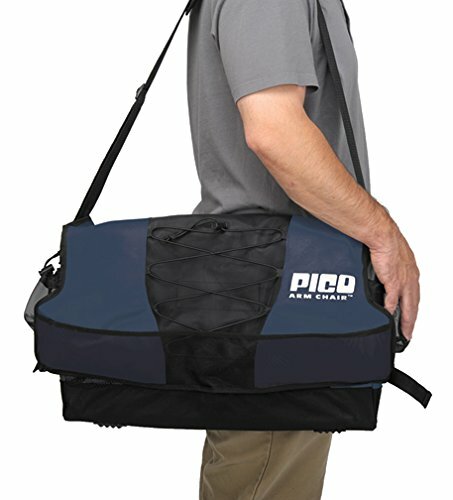 With the 2 shoulder straps on the carrying bag, you can have your hands free using this in the backpack style of carrying. The covering material is heavy-duty 600 denier polyester that will not tear. The steel frame is black powder coated for long years of wear. You will appreciate the convenient cup or glass holder on the side arm. The upright chair dimensions are 28.5-inches wide x 27-inches deep x 36.5-inches high. The seat width is 23-inches. The folded chair is 11-inches wide x 6-inches deep x 44-inches high and it weighs 11.9 pounds holding a person weighing 300-pounds. There is no bar along the front; only the canvas fabric. You will relieve any neck muscle tension sitting in this chair giving your spine relief. The seat aligns your hips and back for support and comfort. Use this chair at the kid’s soccer games, picnics, trips, and sporting events. You will receive the chair, carrying bag with dual straps, a User’s Manual, and a 100% 1-year Warranty. The Kijaro® Dual Lock® Chair item model number 54021 is available in izamal yellow and many other colors including two-tone colors to match your décor or happy mood. The chair seat never sags and has an organizer for magazines, cell phone, or other items. The chair fabric is riveted to the frame so cannot be removed to launder. 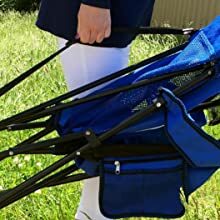 The top-quality feel when seated at the game event, tailgating party, or just the backyard, is wonderful with the portable chair dual locking system. The chair will be comfy in its position for safety and back support. The chair has 2 mesh cup holders on each arm side that will hold 20-ounce bottles or cans, and the fabric is 600 x 300 denier diamond rip stop polyester. The backs of your legs will not dig into the support bars like so many chairs of this chair type do. The feet are made of hard plastic and if you want rubber, you can buy those and glue them on. The carry strap is built into the frame of the chair. This is a quick convenience when packing up to go. But don’t go away yet—the chair comes with a handy carrying bag to protect and store your chair. In the bag the pack measures 45.5-inches tall and about 8-inches diameter at the widest part. The chair sits at a slight angle and the front sits 19-inches off the ground and the back is 17-inches. The dimensions are 26-inches long x 35.4-inches wide x 37.4-inches high and weighs 9.4 pounds. The seat dimensions are 22-inches wide and 16-inches deep to hold a 300-pound person. You will receive the chair, carrying bag with strap, a User’s Manual, and a 1-year Warranty. The chair is made in China. When you go on your backpacking and bike touring adventure, car camping and tailgating, or just want to hang out in the back yard with your family and friends, the best camping chair will give you supreme comfort and stability. With an ice chest cooler you can leave home for a weekend to camp out with your friends, family, and kids.